Remastering 3D images into 2D brings a new view to breast imaging—with less radiation. In the musical world, a synthesizer generates signals that are converted into sound. In radiology, the remastering of 3D images into 2D views is creating a harmonious perspective on the detection of breast cancer. The result is music to the ears of breast imagers looking for the best solutions to early breast cancer diagnosis, reduced recall rates, and limited radiation exposure to patients. Since the FDA approval of digital breast tomosynthesis (DBT) for use with full-field digital mammography (FFDM) six years ago, this imaging technology has become "the better mammogram" for many clinicians. 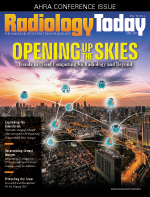 However, in an industry where there's always room for improvement, radiologists are turning to software that can re-create 2D breast images as a replacement for FFDM and, with that, reduce the amount of patients' radiation exposure. Breast imagers are always looking at new technology from the perspective of "Are we doing the right thing?" says Jacqueline S. Holt, MD, FACR, director of breast imaging at Christiana Care Health System's Helen F. Graham Cancer Center & Research Institute in Newark, Delaware. "We were early adopters of tomosynthesis. We acquired our first tomosynthesis machine in 2012 and screened as many patients as possible. We believed in the technology." Recently published studies—one out of the Christiana Care Health System and another from the Hospital of the University of Pennsylvania (HUP)—have shown that taking DBT to the next level by creating synthesized 2D (s2D) images from 3D tomosynthesis data, instead of using FFDM to take the 2D images, not only reduces the radiation dose but also reduces the recall rate. As a bonus, the process maintains cancer detection rates, even showing some improvement, particularly in the detection of invasive cancers. "When looking at the results of our study, we would have been happy if the recall rate had stayed the same, with the reduction in radiation dose, but it actually improved, while the cancer detection rate stayed the same," Holt says. Holt and her colleagues at the Graham Cancer Center were able to take advantage of their facility's status as a health care provider for a large community-based population and conducted a retrospective study, published in the February issue of Radiology, in which they looked at 78,810 screening mammograms performed at the breast center between October 11, 2011, and June 30, 2016. Of those mammograms, 16,173 used the DBT with s2D (DBT-s2D) method, 30,561 used DBT with FFDM (DBT-FFDM), and 32,076 used FFDM alone. The researchers compared the clinical performance of DBT-s2D mammography with that of DBT-FFDM and FFDM alone. Results showed that recall rates were significantly lower with DBT-s2D (4.3%), compared with DBT-FFDM (5.8%) and FFDM alone (8.7%). Overall cancer detection rates were similar among the compared techniques; however, DBT-s2D detected 76.5% of invasive cancers, and the 3.6% false-positive rate for DBT-s2D was significantly lower than the 5.2% rate for DBT-FFDM. "We were surprised that a reduction in radiation also appears to have helped with quality," Holt says. "We're not losing anything when it comes to cancer detection. These findings could be a practice-changer globally." The Graham Cancer Center study comes on the heels of a similar work published in December 2016 in Radiology by a team at HUP. Emily Conant, MD, FSBI, chief of the hospital's division of breast imaging and one of the researchers on the study, says that this group also found benefits associated with s2D mammography combined with DBT as a low-dose screening option. They compared the performance of s2D mammography in a population of 15,571 women screened with DBT-FFDM and 5,366 screened with DBT-s2D, comparing recall rates, biopsy rates, cancer detection rates, and radiation doses between these two groups. The HUP group concluded that there was no significant difference in cancer detection rate for DBT-s2D vs DBT (5.03 of 1,000 vs 5.45 of 1,000, respectively). In addition, they found the recall rate for DBT-s2D significantly decreased (7.1%), compared with DBT screening (8.8%). Also, the recall rate for calcified lesions was lower with DBT-s2D (1.1%), compared with DBT screening (1.6%). "We thought there might be more recalls due to calcium looking different in the reconstructed images, but this wasn't the case," Conant says. "In addition, the number of technical recalls went down." Researchers in both studies also found that DBT-s2D is a good, lower-dose option for all women screened with DBT who may need more frequent imaging. As DBT came into widespread use, screening breast mammography was performed by acquiring both the FFDM and the DBT images. This method required that the patient undergo a second radiation exposure to the breast, increasing dose to more than double the dose of 2D FFDM imaging alone. While the increased exposure does not exceed the recommendations of the ACR Mammography Standards, it is still 39% to 40% above the dose required for FFDM. It also requires the patient to undergo increased time in breast compression. s2D images, reconstructed 2D pictures generated from 3D DBT data sets, meet the goals of reducing dose while at the same time maximizing clinical performance. Capturing these images does not require additional radiation exposure beyond the initial DBT images. Using s2D images also helps to improve patient comfort by eliminating the need for FFDM acquisitions, thereby reducing breast compression times. s2D technology also allows for two 2D views and two DBT views without increasing the dose beyond the two DBT views themselves. DBT received FDA approval in 2011 for use with FFDM. This process became known as the "combo mode," where the 2D images are acquired in the same projection. Hologic was the first to market in the United States with an FDA-approved product, offering DBT as a hardware and software upgrade to its Selenia Dimensions 2D FFDM system since 2012. Hologic received FDA approval in 2013 for its version of s2D software. Hologic's Selenia Dimensions 2D/3D System for DBT and FFDM was used in both the Graham Cancer Center and HUP studies. In addition, the company's C-View software module was used for all s2D image acquisition. Similarly, there are DBT offerings from GE Healthcare, FDA-cleared in 2014; Siemens Healthineers, FDA-cleared in 2015; and Fujifilm, which received FDA approval for its DBT earlier this year. All systems are presented as upgrades to their 2D FFDM systems and, in some cases, also offer s2D image software options. Holt says DBT is available to all patients who present to the Graham Cancer Center's main breast center for screening mammography, regardless of their breast density. The center implemented s2D mammography in 2015 and, for the first three months after it was implemented, it was used with DBT-FFDM for single interpretations. After this trial period, FFDM was no longer routinely performed in patients who underwent DBT screening. However, some women who come to the Graham Cancer Center still opt for FFDM, possibly due to concerns regarding radiation dose or even cost. Also, referring physicians may not have sufficient knowledge of DBT to recommend it for their patients. But when it comes to value, Holt sees an additional financial benefit to the DBT-s2D mammography screening process, as the study results also suggest a reduction in false positives. "The downstream cost reduction when women don't need to be called back for additional imaging amounts to millions of heath care dollars saved," she says. "That's an important consideration in the age of value-based medicine." However, not all insurance companies reimburse for DBT-s2D, "despite the fact that it pays for itself," Holt says. "There are a cost-savings with fewer biopsies and callbacks, plus you can't put a price on a woman's anxiety over her breast screening findings and loss of salary with time off from work for unnecessary biopsies." Users of DBT-s2D agree that synthesized images have a different look and take some time to get used to. Stamatia Destounis, MD, FACR, FSBI, of Elizabeth Wende Breast Clinic in Rochester, New York, says there was a period of learning that took place when her practice began using s2D with DBT. In some instances, noise on the image can look like calcifications, she says, but that hasn't negatively impacted their decision making. "The synthesized image is not like an X-ray," Destounis explains. "You're receiving and viewing a reconstructed 2D image from a 3D image stack, which appears more enhanced. The white areas are whiter and the gray areas are grayer." Destounis, who is also a member of the Editorial Advisory Board of Radiology Today, says the 2D and 3D images are still viewed side-by-side, and radiologists can make their determinations based on comparisons of both versions of the patients' breast imaging. "As has been reported in the studies, we're also seeing reduced recall rates while maintaining good detection rates," she says. Conant adds that there was some concern that there would be more recalls due to radiologists getting used to the synthesized view. "Radiologists want their 2D images, but synthesizing 2D images combined with the tomosynthesis imaging seems to suffice," Conant says. "You can look at the breast in a global perspective. We had no increased callbacks due to the learning curve on reading the reconstructed 2D images." Holt notes that it's possible that the learning-curve effect could have influenced study results, as readers had nearly three years of experience with DBT before s2D was fully implemented. "The synthesized 2D images look different than what radiologists are used to looking at when it comes to either regular 2D or 3D images," Holt says. "Tomosynthesis in general can be an obstacle to users, with the amount of time it takes to read. You still need to look at 2D imaging, comparing left side to right side, and previous images to current mammograms. But each of the four views now has, on average, 50 to 90 images per view, which run through a loop. You have to be dedicated to reading mammograms and breast images." Holt understands that radiologists may be hesitant to rely on s2D images. In those instances, she suggests a gradual adoption of the technology, with an initial trial period during which DBT-s2D is used along with DBT-FFDM. Practices can track their results during that time period and make decisions on how to proceed after the trial period is over. "Much of the controversy surrounding screening mammography is about false-positive findings," she says. "With this method, we are addressing this issue, optimizing patient care, and adding value. "Breast imaging technology has come such a long way," Holt says. "As breast imagers, we knew what tomosynthesis and synthesized 2D images could do. Now, the thinking involving the benefits of synthesized 2D images has to catch up with the technology."